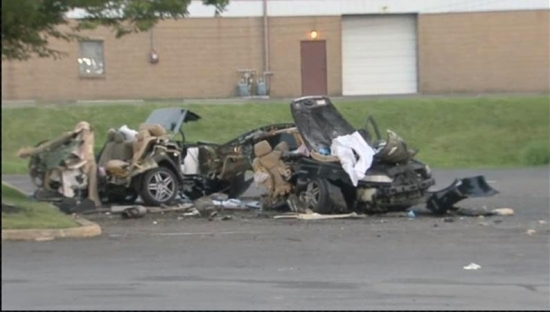 Three people are dead and two are severely injured after a high speed car accident in Bustleton on Wednesday night. It happened near Red Lion Road and Sandmeyer Lane just before midnight. A 2007 Acura was traveling at a high rate of speed and hit a tree, tearing the car in half. Two 17-year-old girls and a 20-year-old male are dead, and a 17 and 19-year-old were both injured. The driver, a 17-year-old male, walked away from the crash, and is cooperating with police. There is no evidence of drugs or alcohol use. After looking at area surveillance, police determined there was another vehicle involved. They do not have a description because they only can see headlights. Both cars were travelling about 75 miles per hour on a stretch of road known for drag racing. Authorities want to talk to people in that other car. Philadelphia police say that a 5-year-old girl was taken from her home overnight Monday into Tuesday by an unknown man and beaten. The girl's mother found her in the backyard on Tuesday morning with facial and head injuries. It happened on the 2600 block of North Hutchinson Street. The girl was taken to St. Christopher's Hospital for Children and treated for facial fractures. The little girl told authorities that she woke in the middle of the night and a man was in the house. He took her outside and kicked and punched her in the face. She was not sexually assaulted. They were able to recover some DNA evidence Police are asking the community to report any suspicious activity they remember from that night.